In contrast to yesterday’s overcast skies and light rain, today’s sunshine and vigorous winds brought smiles to the sailors onboard 35 boats competing in New York Yacht Club's (NYYC) seventh biennial Race Week at Newport presented by Rolex. 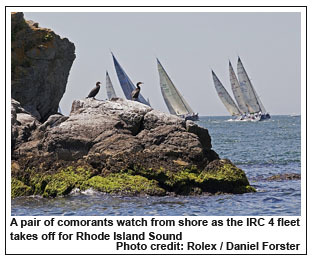 It was a perfect day for NYYC’s Race Committee to send the fleet, all sailing under the IRC handicap rating, on a distance race starting in Newport Harbor, then out on Rhode Island Sound toward Block Island and finally finishing on Narragansett Bay near Quonset Point. With a steady 10-12 knots of breeze and a sea much more settled than yesterday, there could be no finer day for a tour of local waters. Fresh off a class win in June’s 635-mile Newport Bermuda Race, the 48-foot sloop Carina charged through IRC Class 5’s 32-mile tour taking line honors by a little more than 12 minutes. “The breeze held up great,” said Cummiskey. “The course was a little bit of everything.” Carina leads the nine-boat class ahead of Rush, Bill Sweetser’s (Annapolis, Md.) J/109. In a repeat of the first day, George David’s (Hartford, Conn.) Rambler was the fastest in IRC 1, finishing the 53-nautical mile course 23 minutes ahead of Daniel Meyers’s Numbers. 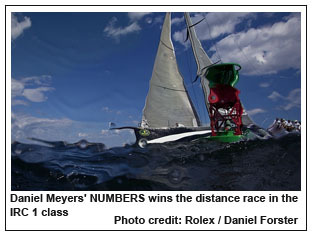 At the start, Rambler pegged the pin end and led to the first mark – a buoy set off of Conanicut Yacht Club – by close to a minute ahead of Ray Roberts’s (Sydney, Australia) STP65 Evolution Racing. Although Numbers corrected, on time, ahead of Rambler, it holds onto the second place overall ahead of Evolution Racing, in third. 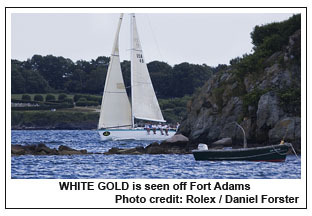 In IRC 3, Philip Lotz’s (Newport, R.I.) NYYC Swan 42 Arethusa finished the 32-nautical-mile course in a little over two minutes behind first-to-finish Big Booty, owned by Pat Eudy (Charlotte, N.C.) Lutra 42. 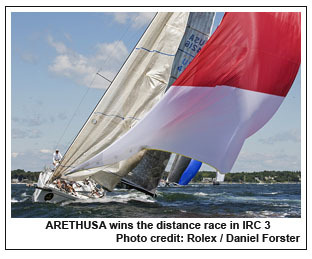 The impressive finish allowed Arethusa to bump up in the standings to second overall. 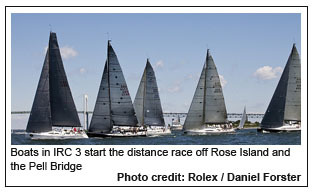 Steve Benjamin’s (South Norwalk, Conn.) Tripp 41 Robotic Oncology leads the seven-boat class. In IRC 4 Christopher Dragon continued its winning ways remaining undefeated and at the top of the class, while Richard Oland’s (Saint John, New Brunswick, CAN) Vela Veloce moved into first in IRC 2. The Southern Cross 52 held its lead over Blair Brown’s (Padanaram, Mass.) 55-foot Sforzando and George Sakellaris’s (Framingham, Mass.) Farr 60 Captivity, which are in second and third place, respectively. After racing, NYYC hosted daily awards and post-racing refreshments in the Hospitality Villa at Harbour Court.